Wow, it’s been a busy week here! I didn’t mean to go almost 2 weeks without posting! I am temporarily without my own computer and my husband has been using the laptop for work for a week, so I’ve had little computer time to post. But it’s not all bad, that means I’ve had more time for QUILLING! I had a couple pair of earrings to make this week for orders from my Etsy shop. And I’m also thrilled that I’ve been able to start on a project that I have been meaning to make for MONTHS. Here is a sneak peak at my early work in progress. I’ll share some more progress of this project in a few days! 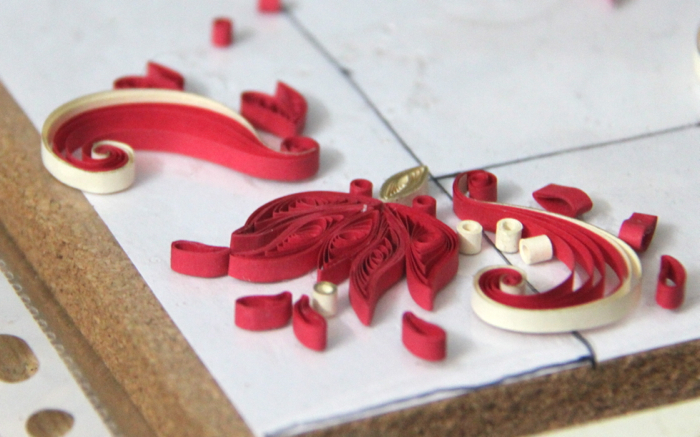 So what quilling projects have you been up to this week? ?